I get biweekly seafood drops from Siren Fish Company, a “SeaSA” serving the California Bay Area and specializing in local, sustainably acquired seafood. I’m very happy with the quality of the catches, and the variety challenges me to experiment with healthy recipes and preparation methods. Herring was on last week’s menu. I’m not typically one for smaller, fishier fish, though I know these are precisely the ones that are packed with the richest omegas. I’m happy to load up the Bows on sardines and mackerel. However, I wasn’t about to hand $20 worth of fresh Pacific herring over to the dogs just because I’d never really given the stuff a chance. So I decided to get down and dirty with a Swedish pickled herring recipe. First, I had to gut and filet ten whole herrings. I’d never filleted a fish before, and I didn’t even have the proper knife. Suffice to say, I made a bloody, wasteful mess of those beautiful silver bodies. Well fine, I thought, the dogs will get a feast after all. Except that neither Bow would touch the scraps. Not even Bowpi, who usually delights in starting each whole raw fish meal by crunching up the head. Bowdu, who had been sitting at attention the whole time I was slicing away in the kitchen, spit out the head I popped into his mouth, barely licked a pile of guts, and wouldn’t even touch one of the fleshier spine chunks that I dropped at his feet! In a desperate attempt to keep the pile from going straight to discard, I boiled the massacred carcasses into a fetid vat of mush. The Bows snorted into their proffered bowls of fleshbonegut paste, and would not deign to sample my creation. I rehydrated their Honest Kitchen with the fish stock that night, and Bowpi threw up the morning after. The remaining stock reeked so heavily, I had a hard time thinking up any use for it. In the end, that whole pot got dumped. At least I can say that my pickled products were quite tasty for a first attempt, so I feel like my efforts ultimately paid off. My filleting technique needs work and the pickling juice can be tweaked, but I did all right for a first foray into totally foreign culinary territory. A couple days later, we received a gift of three fresh herring that a friend had purchased for his cats. 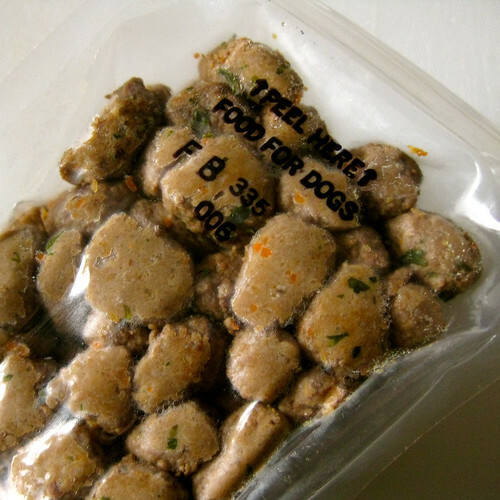 It was a first, rather ambitious attempt at raw feeding for J., and his cats weren’t into it. J. has witnessed the whole fish feeding frenzy at the House of Two Bows before, so he figured his cats were just weird and we could make use of the rejected herrings. And we did indeed, the very next night. The Bows were given one and a half fish each — Bowdu getting the larger share of the extra chopped up fish, of course. But Bowdu wouldn’t finish his portion. Usually he’s the first to plow through his meal, so during feeding times, he’s restricted from Bowpi so he can’t run her off her meal after he’s done. This time, however, she reached the finish line first, and trotted back inside while Bowdu stayed outdoors, hunkered over his headless herring. I thought this odd, until Bowpi started horking up her herring about 15 minutes later. Somehow, the fish had managed to turn a deep, olive green in the short time it churned about her stomach. The entire meal came up in two piles that practically seethed upon splashdown. I held her skinny, convulsing body as I aimed her head towards an area of the floor that I could easily clean up. When her stomach was finally emptied, Bowpi smacked her lips, whimpered a little, and scampered off to the bedroom, where she curled up on the blanket and slept off her nausea for the rest of the evening. When I finished cleaning up Bowpi’s vomit, I went out back to check on Bowdu. I found him in the middle of the yard, re-consuming a pile of his own fresh vomit. That’s his thing; Bowpi is at least sensible enough to leave hers alone. While he busied himself with his own disgustingness, I quietly removed the still-uneaten remaining herring. It did not look or smell abnormal to me, but obviously, it wasn’t right. I bet the cats knew what was up, whereas the Bows utterly lack their feline discretion. This was even more apparent when Bowdu vomited again about twenty minutes later, when I’d drawn him back inside the kitchen… where he then wolfed down his own RE-regurgitated pile of mush before I had a chance to grab the cleaning supplies. Dogs, man. They are what they are because they’re so capable of eating anything. He who survives knows not the meaning of gross. 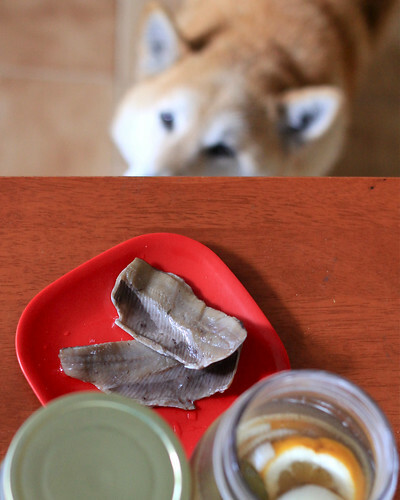 Whole raw sardines are amongst our easiest raw meals, fed with very little prep at the House of Two Bows. I used to get them from the grocery store in frozen bags or bundles of 8 or 16, where each fish consistently weighed two ounces. 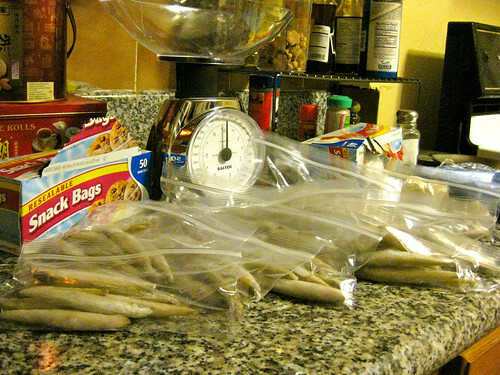 Lately, I’ve only been able to obtain larger sardines, averaging 4 ~ 5 ounces apiece, which is a very workable size. 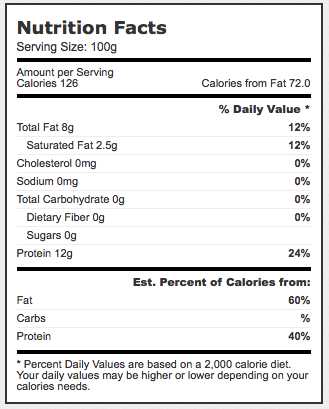 Ignore the % Daily Values, as the calculations are based on a human, 2000 Calorie diet. For her ideal size and activity level, Bowpi’s recommended daily intake is about 500 ~ 600 calories, while Bowdu needs over 700 calories. However, I don’t bother counting calories for myself, let alone my dogs. Instead, I measure out their food by weight or volume, and adjust as necessary. When fed raw meats, Bowpi typically gets 4 oz. at dinnertime, and Bowdu gets 5 oz. According to the nutrition information, I could stand to give them much more than a single 4 oz. 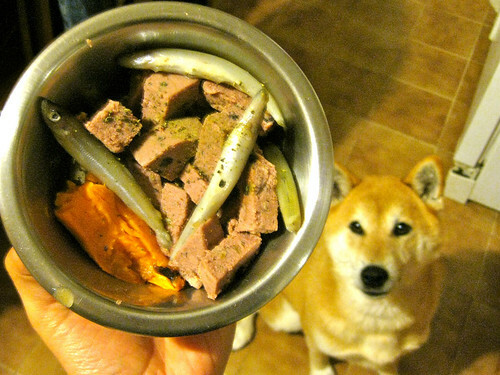 sardine to make a meal with adequate caloric content. Seems I could even give them each two sardines, if it wasn’t for the fat? 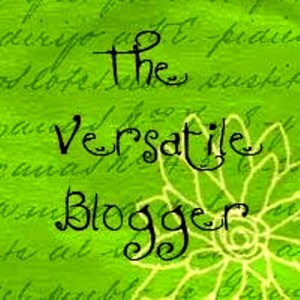 I usually offer a side of pumpkin or sweet potato, mixed with various supplements. GotMercury.org lists sardines as a low hazard fish for mercury content, calculated at 0.016 ppm. We don’t feed raw fish more than twice a week. Bowdu and Bowpi are always fed separately, since Bowdu eats much faster and would chase Bowpi off her share if he wasn’t obstructed or restrained. Usually, Bowdu gets his meal in the kitchen, and Bowpi gets hers behind a closed door in my study room. As part of their twice-daily mealtime ritual, Bowdu will wait outside of Bowpi’s closed door until she’s done eating. 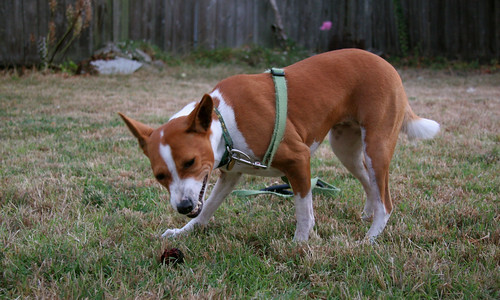 She signals her completion by jumping up on the futon and licking herself (the Basenji version of tidying up after a meal, like a cat), at which point I’ll allow Bowdu into the room to conduct a final inspection of her dish to confirm that she didn’t leave anything behind. Only then will he relax, knowing there are no more edibles at stake. 14 September 2011. 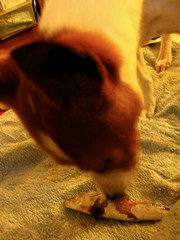 A scrap of partly-frozen ostrich bone as a treat, not a meal. It’s a little different with raw meals. 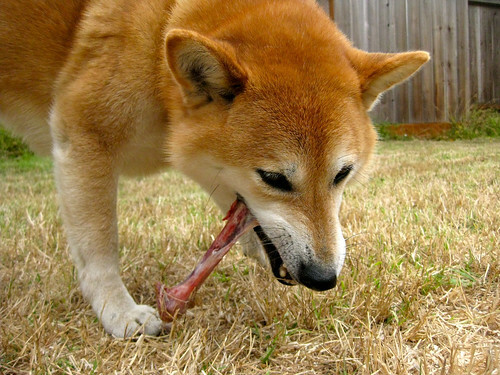 Bowdu is still given his share in his bowl, in the kitchen, but he will immediately pluck out his raw, meaty bone and head directly to the backyard, which is perfect and mess-free. Bowpi is served in my study room, on a towel because she will drag her meat out of the bowl and plop it down on the floor. And if she is not monitored, she will drag it up onto the futon or off the towel, so someone has to be around to watch her eat. For me, it is a pleasure to watch and hear her eat her raw meals. 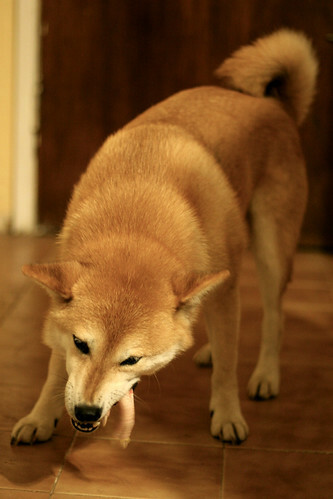 She is a careful, methodic chewer, as graceful as one can be when tearing at a hunk of flesh and crunching bone. 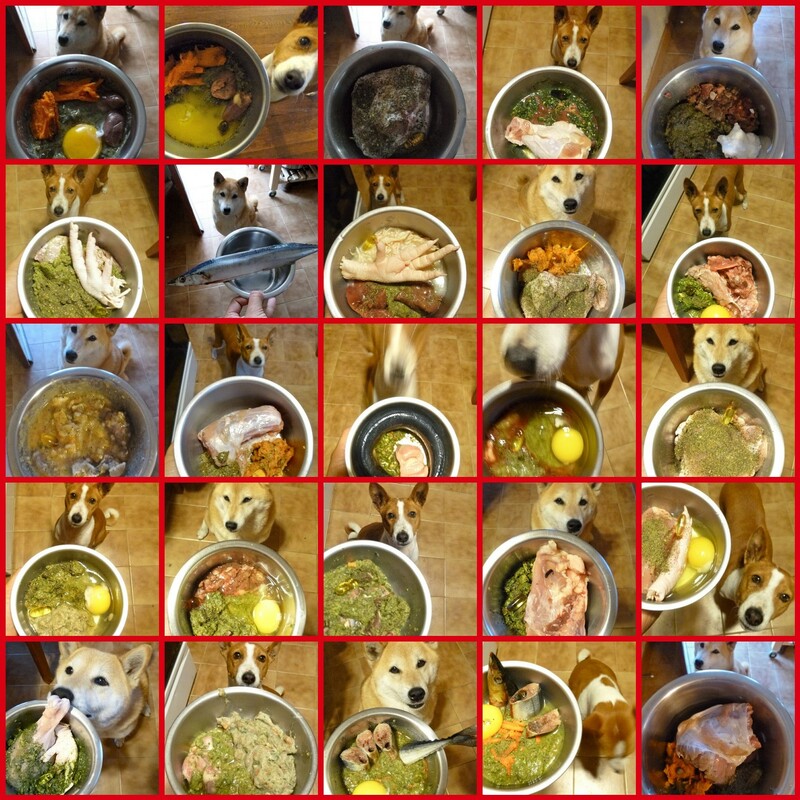 But yes, it is kind of a chore to babysit her meal for the sake of sanitation, which is something that the Doggy Daddy apparently had no patience for when I was out of town last month. Instead, he sent both dogs into the backyard, leashed up Bowdu while he let Bowpi drag her leash, and fed them both out there. It’s a system that worked out pretty well for him since he only wanted to deal with raw sardines, a fairly efficient meal, and none of the poultry that I often mix into the menu. I still prefer to feed Bowpi on towels in my room, especially as nightfall approaches earlier at year’s wane (too dark for dinner). But the DD’s system allowed me to finally get pictures of Bowpi feeding outdoors, in natural light, as it’s difficult to capture her rapid movements any other way. 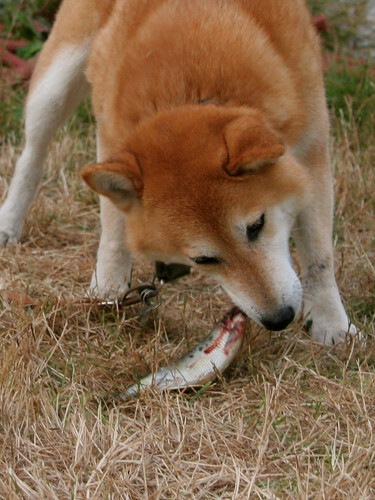 Photographing Bowdu is also a matter of speed because he finishes his fish in about four quick chomps. Like Bowpi, Bowdu also prefers to start with the head. (Apologies to anyone who’s easily squicked…) After he finishes, he’ll quietly watch Bowpi consume her dinner, after which she’ll trot straight indoors. Then we release him, he rushes over to snort her patch of fishgut-splattered grass, and finding not so much as a fin with which to floss his teeth, he resigns himself to the sad fact that dinner is over! I’d previously mentioned that fish is Bowpi’s speediest meal. Strike that. She has since learned to savor her sardines. First she licks the side of each fish, pausing to get a good whiff and to gauge its temperature or whatever she’s doing. Then she’ll start munching, head first. 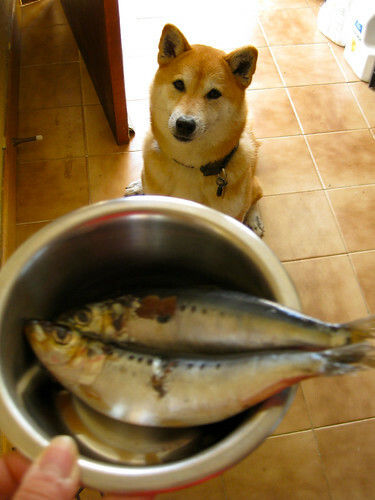 She’ll pull it out of the bowl and onto the towel, which I’ve laid down precisely to keep things “clean” (Bowdu drags his fish and raw meaty bones out to the backyard and Bowpi is fed in another room with the door shut). Sometimes she’ll give the fish a little shake as she’s chewing. Her meal must be monitored, just in case she decides to fling the fish across the room. 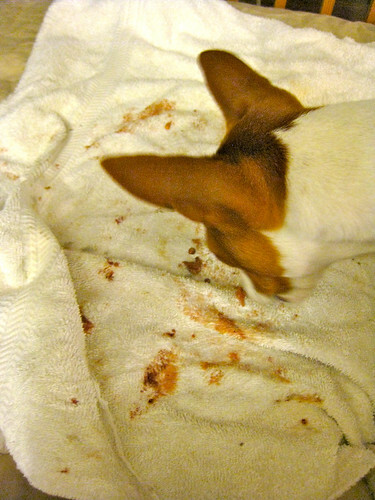 By the time she’s done, it’s a bit of a crime scene all over the towel. Sunday has been raw fish day for the past couple of weeks, since I discovered a local Asian grocery store that sells whole frozen sardines for CHEAP. This batch of sixteen little silver flippy-floppies cost $3.36. Each one weighs between 2 and 2.5 ounces, so two sardines, with a side dish of canned pumpkin and supplements, makes a meal. That comes out to less than 50 cents a meal, per dog. And they both LOVE it. They’d probably love to have raw fish for every meal, but for the sake of nutritional balance and variety, we’re limiting it to once or twice a week. They munch through their sardines way too quickly for this meat to have much dental benefit, I think. Bowpi, who’s quite adept at tearing meat from bones when fed other kinds of raw meat, surprised me with her ability to gulp half a fish at once. Fish is her speediest meal, especially compared to how she lingers over her kibble. I’m going to look into different kinds of fish, as well.